For the last six weeks, I’ve been going through the elimination period of the Autoimmune Protocol. This is the strictest time period of the Autoimmune Protocol. Many foods are eliminated to reduce inflammation in the body, allow the gut to heal, and halt the progression of an autoimmune disease. I am a Type 1 Diabetic, and I went on the Autoimmune Protocol to bring my fasting blood sugar back into Type 1 Diabetic normal range (less than 130 when I wake up). Due to some chocolate candy I ate over the holidays in late 2017, my fasting blood sugar was high, over 160, every morning when I woke up. Even if I didn’t eat carbohydrates after dinner, my fasting blood sugar was high come morning. Once I discovered the source of the problem (dairy in candy), I eliminated it from my diet along with coffee and alcohol which I suspected might be aggravating the problem. I did not see significant improvement, so on February 19, 2018, I began the elimination period of the Autoimmune Protocol to heal my gut and return my fasting blood sugar to normal. I’m happy to report the Autoimmune Protocol has been successful in bringing blood glucose back into normal range for a Type 1 Diabetic without the use of artificial insulin. It has decreased my A1c and solidified the need for healthy routines to manage Type 1 Diabetes. Just in case there was any doubt, I am a diagnosed Type 1 diabetic. In April 2017, at the age of 33, I was diagnosed with Type 1 Diabetes. My stats at diagnosis: A1c 9.6, blood glucose of 512, and GAD65 200+, higher than the test result could show. No question about it, I am a Type 1 Diabetic! Let’s jump into how the Autoimmune Protocol enabled me to have even more control on my diabetes than I did previously with just a Paleo diet. An A1c test gives an average blood sugar level from the previous 2-3 months. I had taken an A1c home test before beginning the Autoimmune Protocol. The result was 6.3. This is still good for a Type 1 Diabetic, as the goal is less than 7. 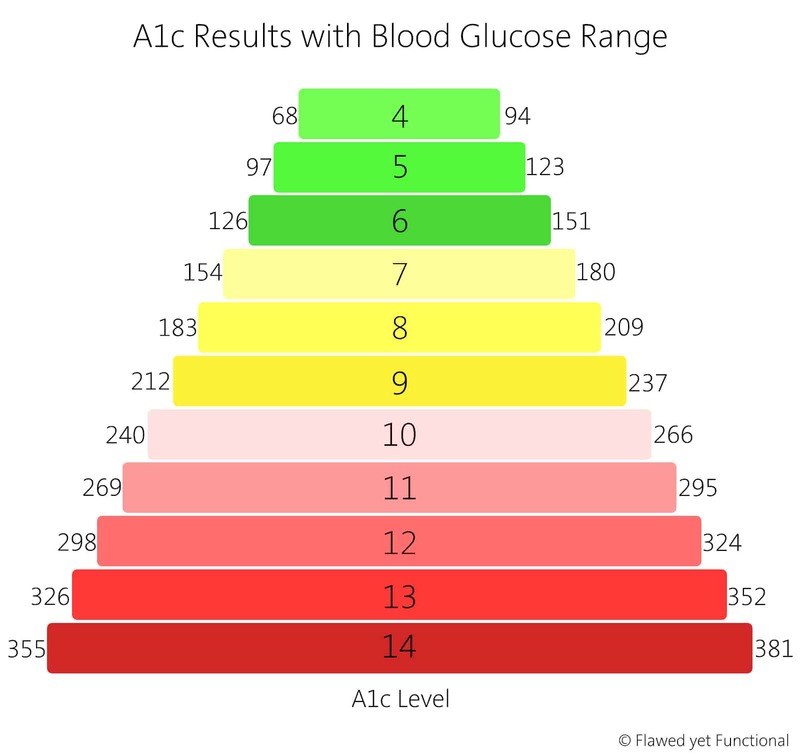 The chart below translates the A1c (middle number, 4-14) result to blood sugar level. As you can see an A1c of 7 means the average blood sugar level was less than 154mg/dl. This is the goal for all Type 1 Diabetics. My result of 6.3 translates to an average blood sugar level of less than 134mg/dl. While this is technically still in range, my fasting blood sugar was too high, 160+ on the regular. After eating strictly on the Autoimmune Protocol for 6 weeks, my A1c result was 5.8. This means my average blood sugar for the last 2-3 months was 120mg/dl. According to The Diabetes Council, this is a normal blood sugar level. A1c results of 5.9 and above are considered pre-diabetic. This is the power of the Autoimmune Protocol! My average blood sugar levels are in normal, non-diabetic range! The autoimmune response, i.e. the attack on the beta cells of my pancreas, has stopped. Largely due to eliminating gluten but gut health is further improved through the Autoimmune Protocol. With my gut wall healed, not leaking foreign substances into the blood stream, low carbohydrate foods, like dairy no longer raise my blood sugar. Since my pancreas is functioning, around 20% I think, my body is able to handle small doses of carbohydrates and return my blood sugar to normal range after eating. The Autoimmune Protocol allowed my gut to heal from the recent dairy exposure allowing my fasting blood sugar to come down almost to normal Type 1 Diabetic range and allowed for lower blood sugar results throughout the day with less variability. Speaking of variability, let’s take a look at my daily blood glucose results. As I analyze my blood glucose numbers from the last six weeks, it is difficult to measure how blood glucose improves when it bounces around each day. I am going to focus on averages, max, min, and range of my blood glucose throughout the six weeks of the Autoimmune Protocol. Let’s discuss each of the measures in the chart above. 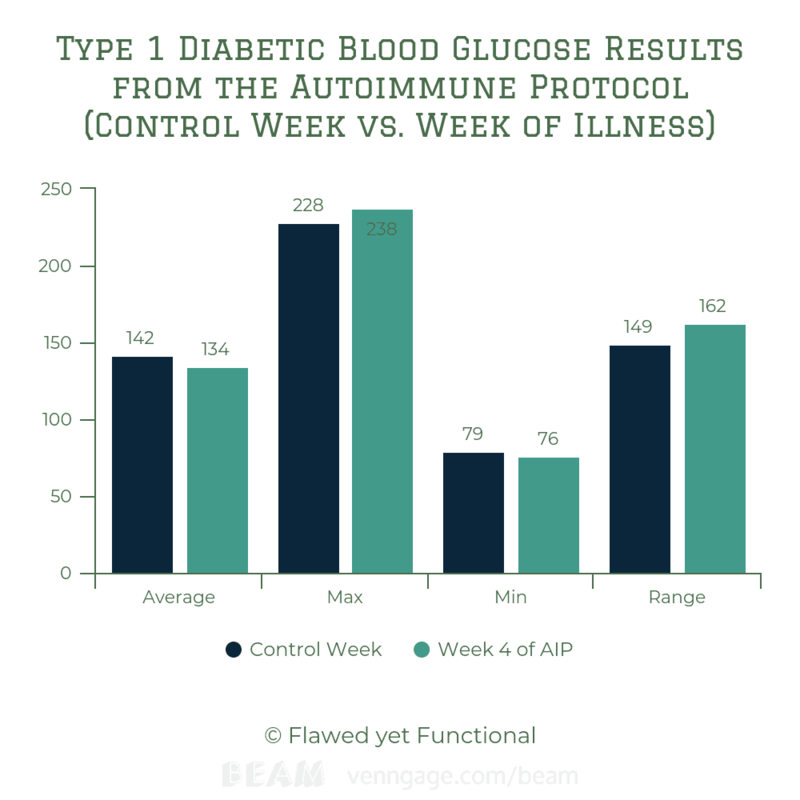 I calculated the average of my four blood sugar tests from each day for the week before I started the Autoimmune Protocol (Control Week) and the final week of the Autoimmune Protocol. Blood sugar levels are not a uniform distribution, so a straight average is not a perfect representation of average blood sugar level, but it is the best I have with the tools available to me. 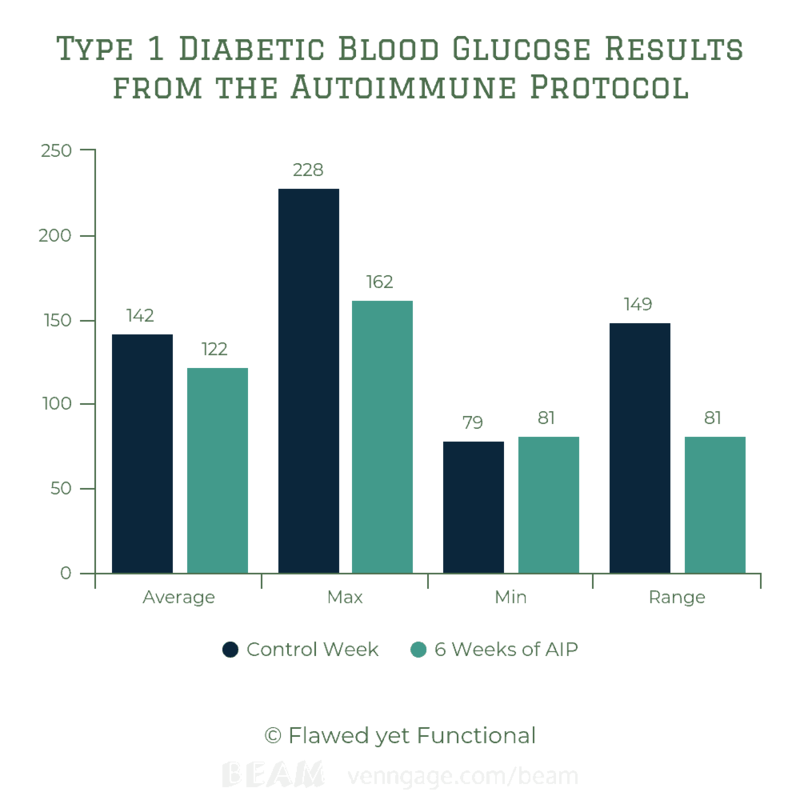 Conclusion: The Autoimmune Protocol lowered my average blood sugar level from 142 to 122. Success! I calculated the maximum reading from the control week and from the final week of the Autoimmune Protocol. Prior to beginning the Autoimmune Protocol, I was having spikes over 200, but once on the protocol, the spikes were much lower, 162. Conclusion: The Autoimmune Protocol has made lower blood sugar spikes. This is simply the lowest reading of the week. There is very little change from the control week (79) to the final week of AIP (81). I still think this is a win. I’m not looking for blood glucose levels lower than 80. Since my pancreas is still functioning, it will keep me from going very low as it won’t give me too much insulin like an injection could. Conclusion: The Autoimmune Protocol has stabilized my blood sugar on the low end too. There are no cases of going too low and needing additional glucose. This is my best result, I think. The range is the difference between the max and the min (Maximum – Minimum = Range). To describe it, the range is showing the swing or variation in my blood sugar. 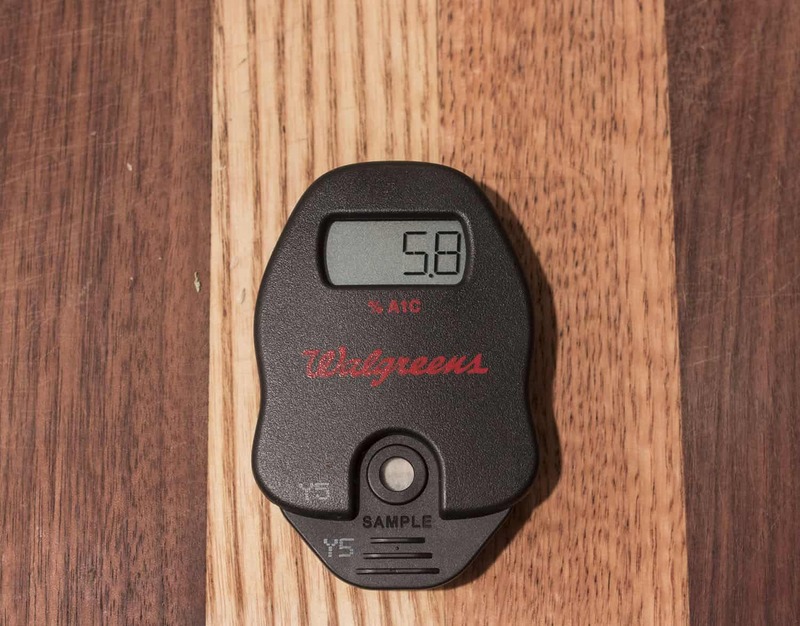 A non-diabetic would have very little variation in blood sugar levels because the pancreas is keeping everything in check, constantly monitoring blood sugar and insulin levels. The blood sugar range of a Type 1 Diabetic could be all over the place if the insulin input does not match the carbohydrate load ingested. I have to be extra careful because I am not taking additional insulin, and I do not know exactly what carbohydrate load my pancreas can handle (my guess is around 20g carbs per meal). The range of my blood sugar readings has decreased from 149 prior to starting the Autoimmune Protocol to 81 after six weeks of AIP. This means less variability in my blood sugar. This is a major win in my book. Less dramatic swings in blood sugar must mean good things for my internal organs and overall management of diabetes. Conclusion: The Autoimmune Protocol has made my blood sugar more stable. There is less variability between my highest and lowest readings throughout the day. While the average blood sugar was a little lower than the control week, the range was higher. My blood sugar was not as controlled even though my diet was right on. When healthy routines are not in place, it has a major impact on my blood sugar levels. Once my family’s health returned, and my routines were back in place, my blood sugar levels returned to Type 1 Diabetic normal. That is the power of good, healthy routines! The Autoimmune Protocol works! If you’ve been looking for hope to manage or even cure your autoimmune disease, this is it. It is working to manage my Type 1 Diabetes better than conventional medicine can with artificial insulin. The Autoimmune Protocol is addressing the cause of the disease: the foods that trigger an autoimmune response. By removing those foods, your body can heal and return to normal functioning. There is hope for autoimmunity, and there is healing. The Autoimmune Protocol is a good place to start. If you want more information, check out my beginning post, weekly reviews (1, 2, 3, 4, and 5), or contact me!